Of all the environmental factors under which a terrestrial organism has been exposed in the course of its evolution, only gravity has stayed constant. Predation, climate, vegetation, and terrestrial or aquatic habitation, for example, have changed, but the intensity and direction of gravity have not. The organism’s ability to detect gravity and to live under a gravitational load is critical for its survival. Even rudimentary ciliated protozoa display positive or negative geotaxis. Fossil evidence shows that the elaborate sensory structures used to sense the acceleration forces are remarkably conserved among vertebrates (Stensiö 1927). Although less is available in the fossil record on invertebrate neurosensory structures, most if not all invertebrate species can orient their bodies’ axis with respect to gravity. Animals, including nonhuman primates, preceded humans in reaching the Kármán line, roughly 100 km above sea level, at the edge of outer space. These early rocket launches validated that terrestrial life can survive the launch and re-entry acceleration profiles and the relatively short-duration exposure to microgravity. In time, scientists realized the unique environment of space, namely the removal of the ever-present force of gravity, provides a unique laboratory to address new hypotheses on the role of external forces on fundamental biology of living organisms. Further, understanding the impact of future exploration missions with human crews relies heavily on the use of animal models that can directly query and track the organism’s morphology and physiology before, during, and after space flight. We have limited our description of space flight-induced changes to a selected range of organisms: microbiota that the organism carries with it into space, infection and the organism’s immune response to spaceflight, development of jellyfish and fruit flies in space, amphibian embryogenesis, and a detailed insight into the neural response, and particularly within the inner ear vestibular organs, of gravity sensors to the loss of gravitation forces in a wide range of species. Most of the descriptions provide a quick snapshot into the organism’s ability to live off of Earth, but can only offer a hint as to the consequences of long-term space flight on the organism’s vital functions. Extended exposures to weightlessness and galactic radiation, alterations in the internal microorganisms and lymphocytes of the immune system within the organisms, and changes within the neural sensory structures will challenge human presence in space and effective countermeasures will be required. When terrestrial biology is taken into the space environment aboard a protective and sealed satellite or craft, the organism takes with it its entire microbiota, the combined collection of microorganisms that occupy the surface and deep layers of skin, the oral secretions and mucosa, the lacrimal glands of the conjunctiva, and the gastrointestinal tracts. These microorganisms include bacteria, fungi in the gut, and single-celled prokaryotes in the gut belonging to the archaea domain. It has been reported that they outnumber the host cells in the human by 10 to 1. Many execute tasks that are beneficial to the host, such as the vast number of species of gut flora that break down certain nutrients that the host otherwise could not digest. However, the normal flora bacteria can act as opportunistic pathogens when the host’s immunity is compromised; thus, this is a real challenge to human spaceflight. Furthermore, should the organism’s microbiota expand due again to a compromised immune system or they populate areas of the body normally not colonized or sterile due to contamination or injury (e.g., the blood, lower respiratory tract, or the abdominal cavity), localized or systemic pathological disorders can develop in the host. A reader is directed to a recent NASA-sponsored release “Researcher’s Guide to: International Space Station” which contains a chapter “Microbial Research” that reviews the history and importance of the microbiota responses to space environment and their potential impact on the animal, particularly the human (http://www.nasa.gov/mission_pages/station/research/researcher_guide). It has been known for more than three decades that spaceflight can cause significant effects on the immune system. On the Apollo missions, 15 of the 29 Apollo astronauts reported bacterial and viral infection during or just after the mission. More than half of the returning Apollo astronauts experienced respiratory, gastrointestinal, urinary tract, or skin infections (Hawkins and Zieglschmid 1975; Kimzey 1977b) (Fig. 1). In later studies, blood samples taken from Shuttle astronauts postflight demonstrated increased numbers of neutrophils and decreased numbers of lymphocytes (Bakos et al. 2001; Stowe, et al. 2001; Taylor and Janney 1992; Taylor 1993). 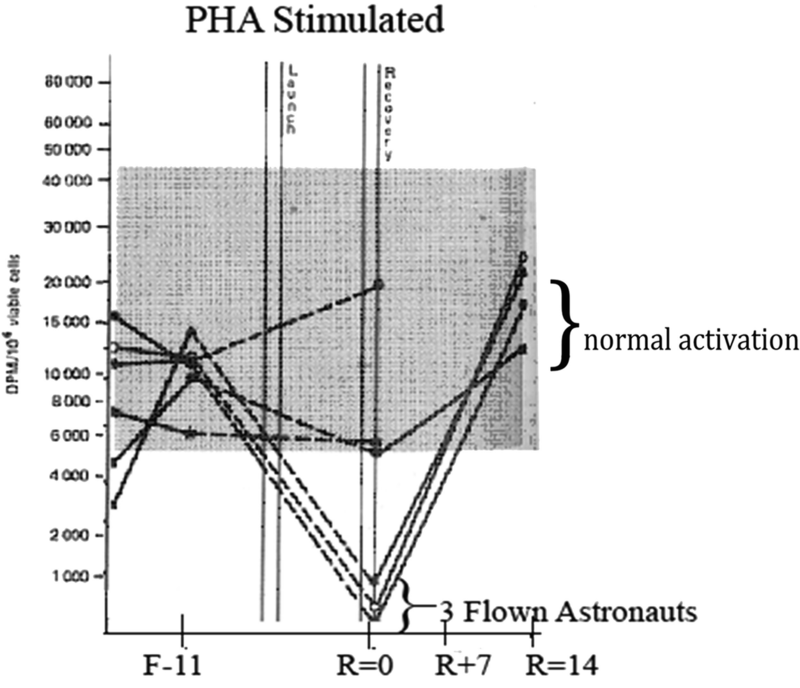 More importantly, delayed-type hypersensitivity (DTH) reactions in astronauts in-flight were markedly decreased compared to preflight (Taylor and Janney 1992). While these early observations did not distinguish between immune dysfunction at the cellular and molecular levels versus potential systemic effects such as the stress response, they fueled additional research into the underlying mechanisms of spaceflight immunosuppression. The relatively high incidence of infection observed in Apollo astronauts in-flight and 1 week postflight was an impetus for increased efforts to study the immune system in Skylab (Kimzey 1977b; Leach and Rambaut 1977). In 1973, NASA launched the Skylab Space Station, and subsequent analysis of blood drawn from primary and backup crews prior to launch and postflight gave rise to the first evidence of altered immune function in space. Lymphocyte response to mitogen treatment was normal during preflight and in backup crews but was significantly reduced in the blood from the nine returning Skylab astronauts (Kimzey 1977b). Correlations with elevated cortisol levels and sympathetic activation detected in blood and urine samples from astronauts led early investigators to propose a whole-body theory and attribute impaired immunity in space to the endocrine system (Kimzey 1977b; Leach and Rambaut 1977). However, in 1984, Cogoli demonstrated with isolated lymphocyte experiments a 90% reduction in lymphocyte activation in μG. As part of Spacelab 1 (launched in November 1983), human peripheral blood lymphocytes were purified and stimulated with the T-cell mitogen concanavalin A (ConA) during orbital spaceflight. Proliferation was measured by 3H-thymidine incorporation 3 days later, and samples were fixed while in orbit. T cells stimulated in orbit demonstrated that μG markedly reduced proliferation, which was less than 3% of the control response. Glucose consumption in unstimulated 1 g and μG samples was not significantly different, suggesting that while T-cell proliferation was inhibited in μG, cell survival and baseline metabolic functions were not affected (Cogoli 1993, 1997; Cogoli et al. 1984; Cao et al. 2001). This was the first time that μG was found to inhibit the immune response in isolated lymphocytes. Later fluorescent microscopy studies by Cogoli showed no significant reduction in membrane bound in microgravity (Cogoli 1997; Cogoli and Cogoli-Greuter 1997). Subsequent experiments on human and mouse lymphocytes revealed a significant decrease in IL2 and IL2Rα synthesis and a reduction in proliferation (Cogoli 1997; Cogoli and Cogoli-Greuter 1997; Walther et al. 1998). Hughes-Fulford and Lewis were the first to show an alteration in cytoskeleton in spaceflight (Hughes-Fulford and Lewis 1996). Lewis et al. later demonstrated that spaceflight leads to anomalous cytoskeletal organization and diffusive microtubule organizing centers in immune cells (Lewis et al. 1998, 2001). Taken together, these findings pointed to a cellular-based dysfunction and a requirement for gravity in the immune response. Despite the presence of a gravitational field 160 miles above the Earth, humans onboard orbiting spacecraft or stations experience approximately 10−4 g because orbital flight generates an opposing centrifugal force to produce a “free fall” or a near weightless environment (Unsworth and Lelkes 1998). It is most likely that depressed immune function is due to reduced expression of early genes key that initiate and maintain T-cell activation. Utilization of a simulated gravity environment via a random positioning machine (RPM) and later analysis of gene expression by Affymetrix GeneChip® technology allowed investigators to ascertain key gravity-dependent gene expression patterns and signaling pathways involved in the human immune response (Boonyaratanakornkit et al. 2005). Inhibited induction of 91 genes in altered gravity (10−3 g) when compared to cells activated in normal gravity helped to pinpoint key regulatory genes and pathways of the T cell. Altered induction of key regulatory gene expression was verified using real-time RT-PCR, showing that impaired induction of early genes was regulated in μG primarily by transcription factors NF-kB, CREB, ELK, AP-1, and STAT (Boonyaratanakornkit et al. 2005; Hughes-Fulford et al. 2005). Later studies by Chang et al. showed that genes regulated by c-Rel/NF-kB, CREB, and SRF transcription factors were significantly inhibited in the absence of gravity (Chang et al. 2012). Moreover, this study indicated that the TNF pathway was a major early downstream pathway significantly inhibited in μG. Furthermore, these experiments indicated that μG was the causative factor for impaired T-cell activation. More recently, Martinez et al. have reported that the same pattern of immunosuppressed gene expression is exhibited in splenocytes in mice under spaceflight and simulated microgravity conditions which demonstrates that at least two mammalian systems require gravity for full immune response (Martinez et al. 2015). Considering that all terrestrial life developed in a gravity field, it is not surprising that mammalian systems require gravity for normal function. With its June 5, 1991, liftoff, the STS-40 crew of the Space Shuttle Columbia began an exciting mission to understand how living things function in the microgravity environment of Earth orbit. Microgravity is the floating effect that occurs on an orbiting space vehicle where objects seem to be weightless because they, and the vehicle they are riding on, are in microgravity. Columbia’s STS-40 Spacelab was the first Spacelab mission devoted to life sciences research, also known as the Spacelab Life Sciences 1 (SLS-1); it consisted of the Spacelab long module mounted in Columbia’s payload bay. The pressurized, cylindrical module was 7 m long and 5 m in diameter. Spaceship Columbia was packed with experimental apparatus and medical instrumentation for use by the mission’s seven-member crew. Many life science experiments were flown on Space Shuttle and Skylab missions, provided tantalizing clues to how the human body adapts to microgravity in Earth orbit and what changes take place in the body (Hale et al. 2011). But often missing from studies were data on the interrelationships of basic biology and model systems in microgravity. The Spacelab Life Sciences 1 mission sought to extend the understanding of the human body in microgravity by conducting studies on seven major body systems. These systems were cardiovascular/cardiopulmonary, hematological, muscular, skeletal, vestibular, immune, and renal-endocrine. An important part of the SLS-1 mission included 2478 jellyfish polyps encased in flasks and bags filled with artificial seawater. Very few studies have been made of developing organisms in space. Tiny, baby jellyfish were flown on the Space Shuttle in plastic bags in an incubator. The jellyfish polyps were induced to grow before and during flight to develop into tiny swimming ephyrae from small, slow-moving polyps. During flight, ephyrae developed on Earth (control group), and some that matured into ephyrae in space (experiment group) were videotaped on Columbia to learn whether they developed and swam normally for later comparison with control groups on the ground. Following landing, researchers compared the flight and control groups to each other. They studied the development of jellyfish structures, including statoliths; grew new jellyfish through asexual reproduction or budding; and observed swimming or pulsing movements of ephyrae. Early in the mission, crewmembers injected thyroxine or iodine into the containers to induce the polyps to change into free-swimming ephyrae. Upon their return to Earth, scientists studied the jellyfish to determine if any differences occurred in jellyfish gravity receptors (sensors) that developed in space from those that developed on Earth (see Liftoff to Learning: From Undersea to Outer Space 1997). 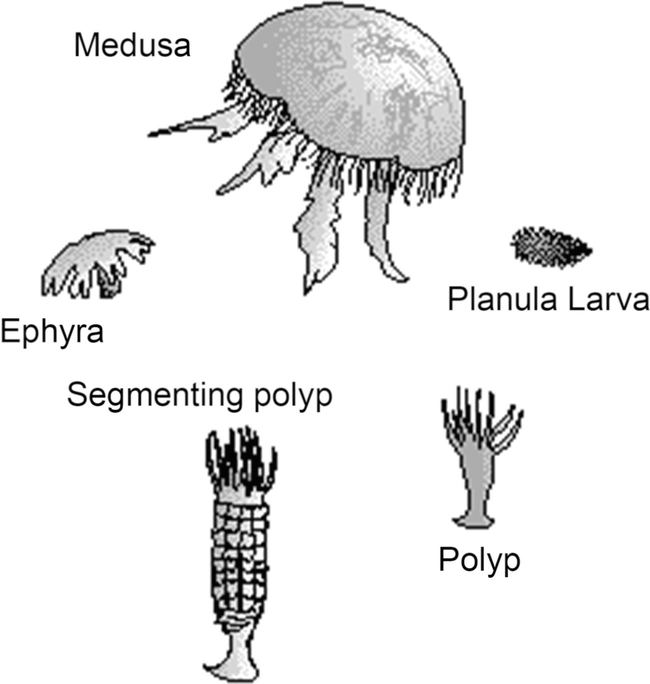 Some of the developing structures of jellyfish resemble structures of humans, although they are less complicated. The jellyfish special structures enable them to swim and orient. These are called gravity receptors, and they resemble microscopic fingers. These structures have calcium crystals at their tips called statoliths, which move when the animals and the gravity receptors move. These sensitive structures provide positional information to the animal based on the direction of gravity and whether the jellyfish are tilted up or down. It is especially important to know whether statolith crystals form normally in space, since humans have similar calcium-containing crystals (otoconia) in their inner ears, which help them maintain balance. In humans, the crystals are not accessible for study during or following spaceflight. Spangenberg and colleagues (1994a, b) discovered that ephyrae developed normally during the flight and were able to pulse and swim in space but tended to circle or loop during swimming since there was no “down” gravity vector. Statoliths formed in normal numbers in space-developed ephyrae but ephyrae from Earth lost statoliths in greater numbers after 9 days in space than did their Earth-maintained controls. Experiments conducted by Souza et al. (1995) showed that gravity was not a prerequisite for the early stages of amphibian embryogenesis. Female frogs, Xenopus laevis, were induced to ovulate during an orbital mission of the Space Shuttle, and their eggs were fertilized in vitro. Although the investigators noted some differences, they concluded that the embryos could develop into normal larvae. Importantly after their return from the space mission, the tadpoles metamorphosed and matured normally, exhibited normal reproductive function, and produced normal first-generation tadpoles. Flies, Drosophila, reared in space did not fare so well and showed a deficit in their innate immune response to infection (Taylor et al. 2014). Using transcription-profiling techniques, the immune response of flies that developed completely to adulthood during a Shuttle Orbiter mission was challenged upon return to Earth. Spaceflight alone altered transcription, producing activation of the heat shock stress system. The flight flies infected by fungus failed to activate the Toll pathway, a pathway essential for embryonic development and immunity. In contrast, gram-negative bacterial infection produced normal activation of the Imd pathway that leads to a signaling cascade that triggers the activation of antimicrobial genes. In contrast, hypergravity by centrifugation in a separate ground-based population improved the resistance to Toll-mediated fungal infections. The authors conclude that the impaired immune resistance from μG and the corresponding improved resistance from hyper G underscore how essential mechanisms for organismal health and survival are impacted by the magnitude of the gravity environment in which the organism is exposed. Over 50 years before the advent of the space age, neuroscientists in laboratories and clinics throughout the world were identifying the neural mechanisms underlying spatial orientation: Self-movement is detected by transducers in the inner ear organs and the receptors associated with muscles and joints, as well as motion perception of an external visual object and whole field from retinal receptors in the eye. The arrival of aviation offered a new, more complex laboratory where man and machine interacted in a rapidly changing environment. This environment proved dangerous to many less experienced pilots when an Earth stationary visual reference, such as the horizon, was lost, leading the pilot to enter the craft into a “graveyard spiral” or other spatial disorientation situation. To avoid this deadly entrapment, the pilot must override the state of equilibrium sensed by the inner ear indicating a level flight path and rely entirely on the craft’s instrumentation. The pervasiveness of gravity on Earth provided the nervous system of the diverse animal species a common reference about which to optimize sensory transduction mechanisms and sensory perception. This vertical reference was now completely violated by the speed at which the individual and visual world are moving and rendered ambiguous by the rapidly changing orientation of the gravity vector and linear acceleration with respect to the individual in aircraft. Thus, we entered the space age in the early 1960s with our eyes wide open when Yuri Gagarin journeyed into “outer space” in his Vostok spacecraft fully anticipating a new class of pilot disorientation issues. With the advent of spaceflight, it is possible to address fundamental questions on the biological principle(s) of how the nervous system in animals, from invertebrates to vertebrates, responds and adapts to weightlessness. A key question is: despite the constancy of gravity, does the nervous system adapt to novel transitions in gravity states, even for transitions of brief duration measured in days such as in Shuttle Orbiter Missions? Another key question is: because of the elemental nature of, say, gravi-reception, how do animals respond similarly to altered gravity states and adapt to the new environment and, in the case of postflight, a return to the original, environment? Calcium carbonate crystals (statoconia or otoconia) of the gravity-sensing organs are used by organisms as a weight-lending load or seismic mass for spatial orientation and balance. Because their density is related to gravity-sensing sensitivity and their biomineralization is not static, changes in gravity load make them at risk to structural remodeling. If the structure of the gravity-sensing organs is arranged for optimal responses in 1G, mechanical alterations may also occur in microgravity. For example, loss of gravitational force might displace the weight-lending load relative to the underlying neuroepithelium (viz., macula), thus affecting neural responses. Altered gravity conditions might also trigger an adaptive response of the weight-lending structures (Wiederhold et al. 1997, 2000, 2003). In weightlessness, it is argued the organism counters the loss of the gravity vector by increasing CaCO3 production and deposition onto existing calcium carbonate crystals, in an attempt to restore correct biomechanical interaction between movement and neural sensation. In hypergravity, it is argued the opposite occurs and the weight-lending load loses mass. In line with this concept, Wiederhold et al. (2000, 2003) reared freshwater snails, Biomphalaria glabrata, on the Shuttle Orbiter and studied them post-landing. They found that in snails developed in space, the total volume of the statoconia was 50% larger than in size-matched snails reared on Earth in a comparable habitat. In a separate study, the statocyst doubled in the number of grains and volume in freshwater pond snails, Biomphalaria glabrata, reared in microgravity (Blüm and Paris 1999). Conversely, Pedrozo and Wiederhold (1994) reared larvae of the marine mollusk, Aplysia californica, at 2–5G and reported that statoconia volume was decreased in a scaled manner compared to the 1G control larvae. Exposure to μG has also been linked to an increased growth of the statoconia in terrestrial snail Helix lucorum (Gorgiladze et al. 2002a). However, the findings are not universally consistent. For example, no changes were evident in Xenopus larvae reared in space (Vinnikov et al. 1976, 1983; Neubert et al. 1986). A surprising increase in the utricular otolith was found in a separate flight study of Xenopus (Lychakov and Lavrova 1985). It is clear that more experiments under controlled states of altered gravity and over prolonged duration of exposures are needed to determine the structural and developmental response of the gravity-sensing structures and the consequence of spaceflight on their function. Pioneering efforts at recording from frog otolith afferents in microgravity were performed by Bracchi et al. (1975) and Gualtierotti (1977). Through the novel use of microelectrodes chronically implanted into the vestibular nerve of frogs, they were able to assess for the first time the neural output of the labyrinth up to about 5 days into the orbital flight mission. Although the number of recorded afferents was too low to draw a solid conclusion, the results are nevertheless informative. The afferent firing was elevated above the control rates in a linear fashion from the beginning of the recording at about 2 h after launch to about 3 days of weightlessness. A return to near normal values was seen in the following 4th and 5th day of the mission. Astronauts typically experience disorientation (and other symptoms of space sickness) within the first 3–4 days of the mission, followed by a disappearance of the symptoms. When tested briefly to a brief acceleration test in orbit, an apparent hypersensitivity of the afferent is seen at 5, 15, 72, and 82 h after launch. The authors attributed these changes in afferent properties as due to the removal of the “g” acceleration that in turn reduces the force-weight exerted by the weight-lending otoconia mass on the underlying utricular hair cell bundles. A similar attempt was made by Highstein and his team for the STS-90 (“Neurolab”) and STS-95 missions (Mensinger et al. 2000; Boyle et al. 2001). They too used chronically implanted microwires into the utricular nerves in the oyster toadfish, Opsanus tau. Although recordings were made within the first days of the mission, they were not interpretable for technical limitations reasons. The main findings were made upon return to Earth’s 1G. Utricular afferents showed extraordinary hypersensitivity, up to saturating responses as low as 0.0026G, to applied inertial accelerations within the first day after landing, and a recovery of function to near normal values was seen on the 2nd day (Boyle et al. 2001). In line with the findings of the Gualtierotti team, an altered otolith component should have profound effects on the orientation of the organism and likely to be causal in vestibular disorientation or space adaptation syndrome. The demonstrated time course in the altered otolith responses in frogs and fish parallels the time course of disorientation experienced by space travelers and gives support to this hypothesis. Despite extensive and technically challenging efforts using higher-order mammals such as subhuman primates, particularly on unmanned Russian orbital missions, we have suggested, but nevertheless clear data, that relatively short-term exposures to weightlessness dramatically alter vestibular sensation (reviewed by Cohen et al. 2005). Studies in the invertebrate mollusk suggest that altered gravity likely affects the statocyst function in a comparable manner as observed in frog and fish otolith organs. Similar to its vertebrate counterparts, the mollusk statocyst system has a weight-lending mass of calcium carbonate disk-shaped grains called statoconia, a neuroepithelial layer containing small supporting cells and the large gravi-sensing receptors, and an output that drives compensatory body reflexes to external perturbations. In two unmanned orbital missions on the Russian spacecraft Foton M-2 and M-3 of 16- and 12-day duration, respectively, Balaban and colleagues investigated the response of the gravi-sensing system of the terrestrial snail Helix lucorum Linnaeus (Pulmonata, Gastropoda) to the space mission, which persists largely of the weightlessness, within a brief delay after landing (Balaban et al. 2011). A ubiquitous behavior found throughout nature is the whole animal response to sudden orientation shifts with respect to gravity, known as negative gravitaxis. This reflex was studied in each snail, and the latency of body reorientation to sudden 90° head-down pitch was significantly reduced in postflight snails indicating an enhanced negative gravitaxis response. The same snails tested for their behavioral response to tilt the statoreceptors were recorded using electrophysiological techniques to controlled tilts. In line with the increase in reaction to tilt the statoreceptors’ response was significantly increased indicated an enhanced sensitivity to perturbations following μG exposure. In a related ground-based study using centrifugation the snail’s gravitaxis response and its statocyst receptor function to hypergravity mirrored the μG data: a delayed reaction to tilt and a reduced receptor sensitivity of tilt reflecting the capability of the statocyst system to adjust its sensitivity in response to a prolonged change in the force of gravity (Popova and Boyle 2015). Interesting, the neural responses seen in the snail, frog, and fish are remarkably similar. In frog and fish, the responses were recorded in the vestibular nerve, one synapse away from the sensory hair cells; in the snail the responses were made directly from the receptors. Until the vertebrate hair cell is directly studied during or immediately after spaceflight, we can only speculate whether or not shared mechanisms are driving the adaptive changes in output of the vestibular end organs. Regulation of specific (neuro-)peptide signaling in the statoreceptor might be altered under physiological loads such as changes in the gravitational force. Primary statocyst receptor cells in snails express a product of the preproHPep gene – a pedal peptide, HPep – and regulation of this gene expression pattern might signal how the statocyst receptor is “tuned” by the gravity vector. In the garden snail, Helix aspersa, a significant increase in mRNA expression of the gene encoding HPep, a peptide linked to ciliary beating, in statoreceptors was observed in postflight snails; no changes were seen in FMRFamide, an endogenous peptide found in the nervous system throughout the animal kingdom and constitute a major class of peptide neurotransmitters in invertebrates (Balaban et al. 2011). It is anticipated that future studies will reveal the existence of both short-term, more immediate, responses to the space environment as well as lasting influences on cell function after long-term missions. Studies based on an unmanned Foton satellite and aboard the manned Mir space station examined whether a feedback mechanism from more central neural centers was responsible for the changes in the snail’s statocyst function brought on by spaceflight (Gorgiladze et al. 2002b). The proposed feedback to the statoreceptors was eliminated by severing the vestibular nerve to the cerebral ganglion that contains both receptor axons and efferent fibers. Although the observed results suggested a possible inactivation of the receptors via an efferent system, the experiments were conducted at a considerable delay after landing (31–36 h). In both invertebrate and vertebrate species, it is reasonable to assume that receptors and hair cells are under a continuous efferent adjustment based on prevailing behavioral requirements. Whether or not this is indeed a mechanism capable of exerting a long-term calibrating influence on the end organ based on the existing gravity level remains a speculation (Boyle et al. 2018).